He’s an engineer, the man who sits at the desk two feet away from mine and directs my day-to-day tasks, and he doesn’t have any patience for the stupid or the intellectually lazy. Their Vietnam simpatico notwithstanding, he doesn’t have much love for Senator McCain. I’ve said it before and I’ll say it many more times before the November 4 election: There’s mature, there’s old, and there’s old. I still have a John McCain for President button that I got in 1999, and would have seriously considered voting for him in 2000. I quoted him in our upcoming book on the Vice Presidents (Veeps: Profiles in Insignificance, Top Shelf Productions, by Bill Kelter and Wayne Shellabarger [Diamond: JUL084291 – ISBN 978-1-60309-003-2]). Very nearly everytime John McCain steps on a stage or opens his mouth his days, he proves that he hasn’t maintained his physical and intellectual viability with the same persistence and rigor that allowed him to survive over five years as a Viet Cong Prisoner of War. He changes position faster and with more frequency than even he realizes, he doesn’t know who we’re fighting in Iraq, or might be fighting in Iran–and his flip (and off-key) “Bomb-Bomb Iran” schtick is entirely inappropriate and surprising for a candidate who should know, unlike the stateside President Bush (who joked about the never-found WMD at the Radio & Television Correspondents dinner in 2004) that war is a thin comedic reed, especially when he has over 4,100 dead American kids to answer for, for a war he entered on the basis of an even thinner reed. The New York Times just printed an article today that only pours more gasoline on the smoldering embers that are the current McCain campaign. A lot of people have pointed out rightfully that John McCain is a bad actor, whichever definition you apply, but it’s a sad truth that he can’t get his lines right. And that’s even worse and more telling when they’re fed to him by his teleprompter. Well, we can. Can you? If there’s one quality you need to possess as a Presidential candidate, it’s the ability to think and adjust on the fly. 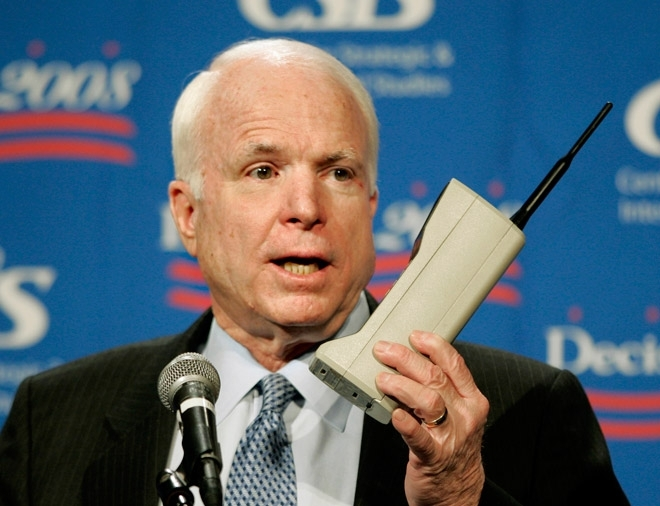 John McCain used to have it. He apparently doesn’t anymore. Well, yes, the superdelegates helped put Obama over the top for the requisite delegate count, but the participation of the nearly 20 million voters held no small part in the 30-plus states that Barack Obama won on his way to securing the nomination. That was a dumb thing to say. He claimed credit for the passage of the G.I. Bill for the 21st Century, which was written and introduced by Senator Jim Webb of Virginia, and a vote for which Senator McCain opposed early and often and then didn’t even show up in the Senate to vote against it, to at least support his earlier rhetoric against it. Dumb and disingenuous. He spent the primary pummeling Mitt Romney for his assertion that waterboarding wasn’t torture. Just three weeks after he took obvious delight in slapping around the former Massachusetts Governor for Romney’s defense of waterboarding, he showed up in the Senate to vote against the Intelligence Authorization Act for Fiscal Year 2008. Again, dumb and disingenuous. Offshore oil drilling, the gas tax, the Bush tax cuts, “the agents of intolerance,” the unforgivable push-poll attacks of the Bush-Rove team in 2000 that McCain forgave with his cringe-inducing hugs of George W. Bush. Etcetera, etcetera, etcetera. I’ve never thought McCain a moron. He wasn’t, and isn’t. His latest position shifts have smacked of naked ambtion. But this is more than political opportunism. He survived the Hanoi Hilton, and you can say that he’s only surrendering his dignity to the inebriant of ambition, but his statements (and misstatements) would suggest a deeper misfire in the aged senior Senator from Arizona. Age and mortality. Enemies that none of us can possibly hope to elude. It might turn out that Senator McCain is only nakedly, shamelessly ambitious, and perfectly willing to sell his soul to win the Presidency, but it’s more likely that the chinks in his mortal armour are showing. The Presidency is the greatest stage in the world, and you’ve got to know your lines. If you don’t know them, that’s bad. If you can’t repeat them when they’re fed to you, that’s really bad. The greatest and most dignified stand is knowing when to stand down. John McCain may be far past his last act. The voters may well make that call come November 4. But someone should feed this line to Senator McCain.